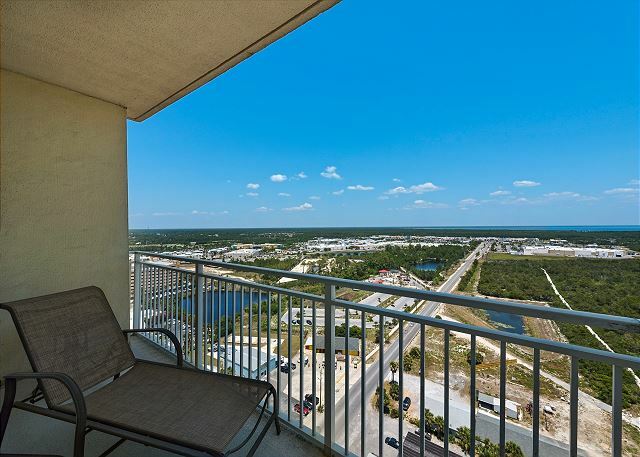 Enjoy true luxury living in this twenty-first floor, two-bedroom/two bath Aqua condominium. Enjoy sweeping Gulf views from your private, elliptical terrace. Exquisite interior spaces include kitchen with granite countertops, refrigerator with icemaker, microwave, and laundry with washer and dryer. And an elegant master suite features a separate terrace entrance, private bath with double vanity and generous storage. Had a great time, great place to stay and have been there multiple times. Our favorite place in PC, close to Pier Park and Shuckums is just across the street. Only thing the mattress or box springs in the master bedroom is getting close to needing some attention; the edges lean away from the center of the bed making it feel like you could roll off. Doesn't change the way we feel about the resort and the room was in a perfect location. We'll be back!! The rental was beautiful and so clean great. Had a great time. Enjoyed the view from the 21st floor. Great, very clean,staff was great. Very satisfied with our stay. The condo was just as described and very clean. Very spacious with a wonderful view of the beach and Front Beach Road. Pier Park was within walking distance as well as many other restaurants and activities. Would definitely stay again. It was amazing. The room was amazing as well as the view and staff. Would stay here again. Loved having the washer and dryer in the room.